The sockets in this 6 piece 3/8" drive metric long hex head socket set feature outstanding corrosion resistance as a result of our proprietary in-house plating process. Long length bits provide the extra reach needed to turn hard to access fasteners. Precision tip ensures a tight and secure fit with the fastener. Made in Canada and backed by Gray Tools worry-free lifetime warranty. Contains Sizes: 4, 5, 6, 7, 8, 10mm. The sockets in this 14 piece 1/4" drive 6 point metric standard chrome socket set feature outstanding corrosion resistance as a result of our proprietary in-house plating process. In addition, Gray sockets are made from premium tool steel for maximum durability and feature a distinct brilliant jewellery-like finish. Made in Canada and backed by Gray Tools worry-free lifetime warranty. 10-Piece 3/8 in. Drive 6-Point SAE Deep Socket Set features Deep-well sockets made from chrome vanadium steel for excellent strength. The finish provides resistance to corrosion. The chamfered lead is for quick and easy placement onto fasteners. 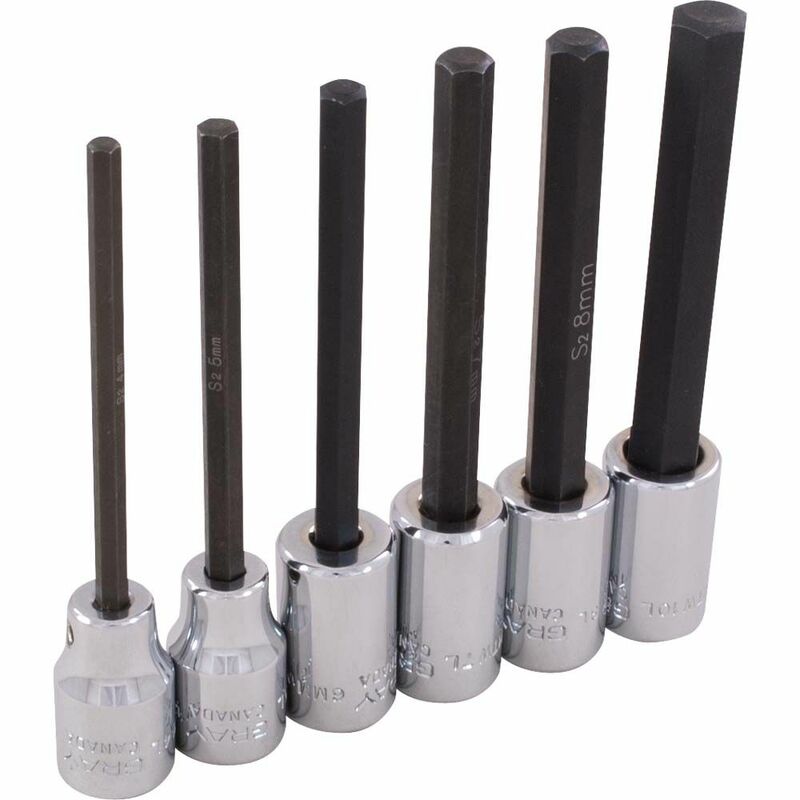 Socket Set Hex Head 6 Pieces 3/8 Inch Drive Extra Long Metric The sockets in this 6 piece 3/8" drive metric long hex head socket set feature outstanding corrosion resistance as a result of our proprietary in-house plating process. Long length bits provide the extra reach needed to turn hard to access fasteners. Precision tip ensures a tight and secure fit with the fastener. Made in Canada and backed by Gray Tools worry-free lifetime warranty.